Home / Author Interview / Author Interview--> Saurabh Garg, author of The Nidhi Kapoor Story! 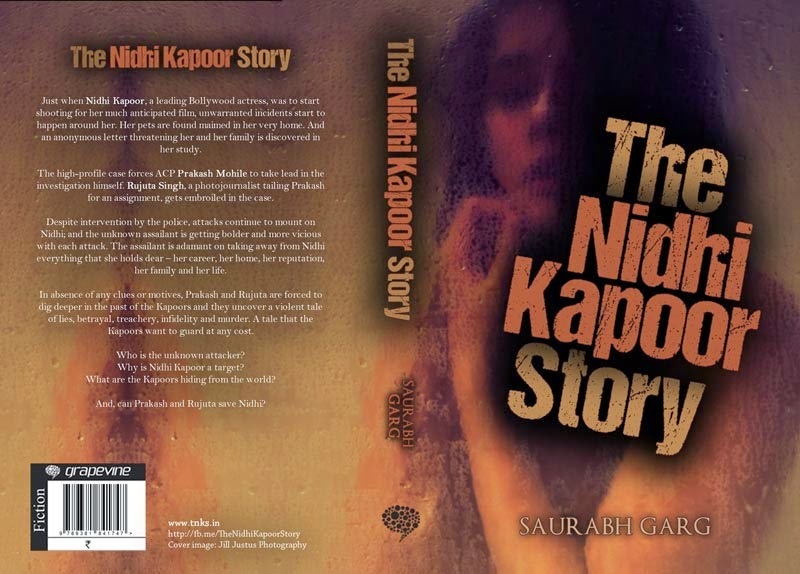 Author Interview--> Saurabh Garg, author of The Nidhi Kapoor Story! I am so excited to have with me today, Saurabh Garg, the up and happening author of The Nidhi Kapoor Story which is creating waves ever since its publication in November of this year. Before I share with you my very interesting chat with Saurabh, here is an introduction to this very talented author who has proved that he is here to stay! Curious marketeer by the day, Saurabh Garg is a storyteller by the night. Although he's been weaving stories for almost ten years now, The Nidhi Kapoor Story is his first book. Apart from writing, Saurabh is passionate about startups, travel and poker. When he is not working on creating characters and plots for his upcoming stories, he likes to meet and talk to interesting people and ask them stupid questions that often don't have answers. Saurabh maintains a very elaborate bucket list. The item on top of his list is to visit every country in the world. So far, he's been to 15. Welcome to Njkinny's World of Books & Stuff, Saurabh! Q1. In one sentence, what is your book about? Allow me to use three. Unwarranted incidents start to happen around a famous Bollywood actress, Nidhi Kapoor. ACP Prakash Mohile and Rujuta Singh, a photojournalist, team up to try and identify the unknown assailant. Despite intervention by Prakash and Rujuta, the attacks continue to happen on Nidhi and each attack is more vicious and dangerous than the previous. Can Nidhi survive the onslaught? Q2. When did it come out? Who is the Publisher? Any notable awards or praise for it? Published by Grapevine India, the book released in the second half of Oct of 2014. In terms of awards or praises, I haven’t had any so far. But, most people who've read the book have expressed their desire to see the book made in to a film. I think it’s a big big gratification! I guess you’d ought to read the book for yourself to understand why they’re saying so! Well the inspiration did not come from one person or one incident. I’ve had this dream of being an author for quite some time. One fine day, on my way back from work, I decided that I've had enough and I have to give writing a shot. And I quit. And I wrote. And rest, as the cliché goes, is history. Q4. How did you get your first break as an author? I did not wait for a break to happen! I just wrote and did not even think about publishing or anything else while I was writing. Once I finished my manuscript, I approached a few publishers and one of them accepted me! So I don’t really have any great, insightful stories about getting breaks. Q5. What has been the biggest surprise or learning experience you’ve seen through the process of seeing your book(s) get published? I am a huge cynic and I tend to believe that every action by us humans is guided by some ulterior motive or something. But while I was working on the book, so so many people came forward and extended all sort of help. From helping me find a publisher, to design of cover, to edit, to arrange for sales, to spread word, to carry a review and lot of other things, big and small. Most of these were strangers and they went beyond what I could expect from even friends. So I was surprised to know that the world is full of kind people. I was totally blown away by that. I now try and give back to the writing community. As much as I can. Q6. How and when did you realize that you had the talent for writing and could become an author? I don’t know if I had the talent for writing; but I do know that I loved writing. And I’ve been in love with writing for more than ten years now. As far as being an author goes, I don’t think that I have become an established author. To me, writing is like a craft that I can keep working on and keep improving. The improvement is an ongoing process that does not stop. Each word, each sentence, each book that I write will help me hone my craft further. I don’t think a time would ever come when I’d be comfortable saying that I've arrived or I have the talent. Q7. What are you doing to reach out to readers and book enthusiasts? A lot actually. It is divided into things that I am doing online and offline. For online, I have a very active Facebook page. I am trying to get as many readers on it as possible. Request you to join the page as well. It is at http://facebook.com/TheNidhiKapoorStory. I also post updates on twitter and instagram. I launched India’s first book related crowdfunding campaign on www.Catapooolt.com. I did other things like contests, giveaways and posts on book forums, book websites and other such places. For offline, I am trying to go to colleges and make them aware about the book. I wanted to do a lot of in-store promotions at bookstores but I don’t have the money for that. Neither am I big for any lit fest to show interest in having me as a panelist. This bit, as you can see, is very limited. So, I am doing a lot but most of it has been ineffective it seems. Will you (or any of your readers) want to help me market the book? I am serious about this! Please write to me and we’d take it from there. Q8. What is the one thing that you hope readers take away after reading your book? I want the readers to realize that most of our actions are guided by few fundamental afflictions that us humans suffer from. If we could tame those afflictions, we would become better individuals and as a result, a better society. Having said that, to someone not interested in pop-psychology, I just want the readers to enjoy the time that they spend while they read the book. There is no greater satisfaction in completely immersing yourself into any one activity. And if someone could get immersed in the book while reading it, nothing like it! Q9. If someone were to tell you one thing before you started writing, what do you wish it had been? I wish someone told me that writing was going to be a lonely profession. If I had known this, I probably wouldn't have took the plunge. Of course you have family, friends, teachers, mentors, support groups, books, alcohol, coffee, cigarette, women (or men) to keep you company. But end of the day, you’re alone. You’re by yourself while you are writing. And the loneliness only increases once you publish and reviews start to pour in. Thankfully, I learnt the art of coping up with the loneliness over the last year! Q10. What are the ten things people don’t know about you? I believe that the ability to express (by talking and writing) is the greatest gift we have as humans. I want to excel at it. And since it does not come naturally to me, I have to work hard at it. And I do. I write because I love writing. I have said this earlier and I’d repeat, I love the dance that my fingers do on the keyboard while words appear magically on the computer screen. Oh, I write on a computer. I write on a Macbook and I borrowed it from my sis. I prefer Apple products over other for writing. Simply because the keyabord is brilliant to type on. And I can do other things like basic image editing for marketing. When I write, I don’t really have a target audience in my mind. I merely write for myself. And then assume that if I like what I’ve written, others would like it too. Like the target audience, when I write, I don’t really have a definite end game in my mind. I just continue to write, hoping that I point would where each character would get what they want and each conflict would get resolved. Oh, I love to write in the morning. But I love nights. So, it’s often a battle between my late night sojourns and early morning writing sprints. The early morning sprints happen at a Starbucks close to my home. I love them. 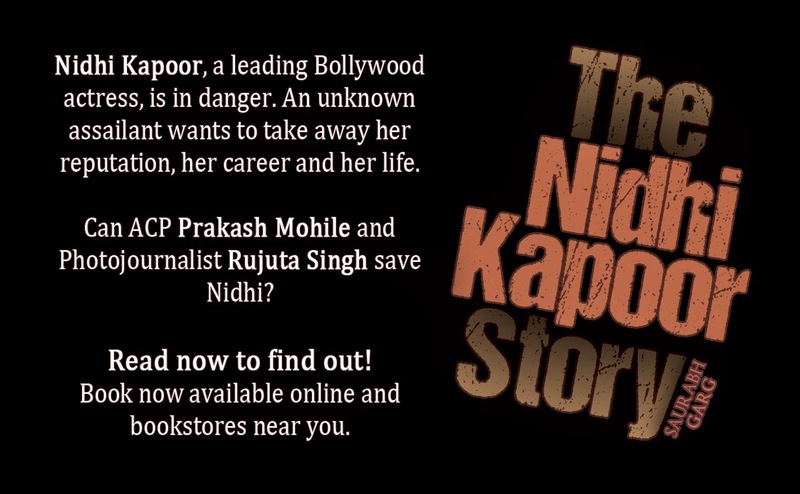 A large part of The Nidhi Kapoor Story was written at a Starbucks café. The tenth one, I would share with only those ones who mail me (on friends.of.tnks@gmail.com). And I would do a lucky draw for everyone who mails me. I’d send a copy of my favorite book! Q11. What’s next up for you, writing-wise? I am already working on the next book. So I spend a lot of time thinking about that. I like doing extensive research when I write. I am in that phase right now. It’s not actual writing but its taking notes, making sketches, playing with doodles. Second, after readers said that they’d want to see The Nidhi Kapoor Story made into a movie, I’ve opened up discussions with a few producers. One of those conversations is at an advanced stage; so I am working on getting the screenplay in place. That eats whatever limited time I have, after my day job! Thanks for talking to Njkinny's World of Books & Stuff, Saurabh! I had a great time and wish you the very best for the future.